NOSE: I love the cognitive dissonance when a pitch-black beer smells like a big, bright IPA. Cascade hops dominate…big, bitter grapefruit overtones with lots of other citrus fruits (tangerines, oranges, lemons) detectable. Definitely an IPA. TASTE: Excellent. Instead of going the Russian Imperial Stout route and trying to balance a huge hop profile with massive, thick malty sweetness, Southern Tier went 100% IPA. There’s a touch of dark roasted malt, but it’s drowned out entirely by the aggressive, but delicious citrusy hops. Good bitterness and a touch of alcohol burn at the end round out this well-crafted brew. MOUTHFEEL: Lush and creamy, but not heavy at all. Proving yet again that dark beers aren’t necessarily heavy beers. This is a great brew to roll around your palate. DRINKABILITY: Very high. The highlight (for me) of the draft options at RFD in DC. Wish it was readily available in my neck of the woods. Posted in Tasting Notes.Tagged Black Ale, Imperial, Iniquity, RFD, Southern Tier, Washington DC. I’ve been extremely underwhelmed by Southern Tier, but this beer intrigues me. I’ll be sure to pick one up next time I’m re-stocking the stash. I was with you for awhile, but Southern Tier has completely won me over recently. They do “gimmicky” beers better than any brewery in the country. In a way, I think they’re the brewery that Dogfish Head WANTS to be (which sounds very strange considering how much more successful and popular DFH is). Southern Tier’s Choklat, Mokah, Jahva, Pumking and Creme Brulee all taste exactly as their name implies. I’d love to be my normal, pretentious, beer-snobby self and mock them for that. But the truth is…I love those damn beers. I don’t care that the Mokah tastes like liquid frosting…it’s absolutely delicious. And even if you don’t like beers that cause diabetes, Southern Tier also makes some brilliant Imperials (Gemini, Unearthly, and Iniquity) and a very well-regarded Barleywine (Backburner…haven’t had it yet). Like DFH, they do a lousy job with fruit beers (seriously American brewers…leave the lambics to the experts in Belgium). And like you, I’ve been somewhat underwhelmed by their standard offerings. But as far as go-for-broke, high-gravity, extreme-flavored beers, Southern Tier might be one of my new favorite ale factories. More than enough evidence for me. Part of my distaste for Southern Tier is due to their glossy labels so if I got a bad beer out of the bottle that was two big strikes against them. What a stupid way to judge a brewery though – Based on their packaging. I’ll get a nice lineup for the weekend and let you know how it goes. It’s been interesting watching the battle over what to call this style. 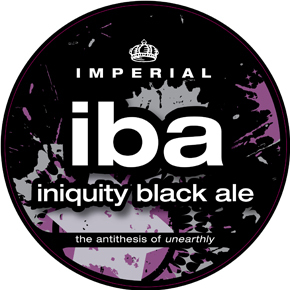 New England seems to be behind “Imperial Black Ale” or alternatively “India Black Ale” (I think the other alternative “Black IPA” is dumb, because how can an ale be black and pale? ), whereas the West seems to be pushing for “Cascadian Dark Ale”. Either way, I enjoy the dark roasted malt with big hoppy goodness combo. Beerford, stick with me on this. CDA, motherfuckers. Cascadian Dark Ale is a misnomer for beers like the Iniquity. First, Cascadian implies that they’re strictly using Cascade hops which obviously most of the beers in the style are not (while they may use lots of Cascade, there are plenty of other varietals in there). Second, most of the Black IPAs I’ve had are legitimately black. “Dark” just seems a little wishy-washy. That being said, Beerford’s point about Black IPA is spot on. A “Black Pale Ale” is just stupid. I think the brewers consider the Imperial IPA concept so well understood that they don’t mind modifying it with the word “Black”. But personally, I prefer accuracy so as not to confuse newbies. So Black IPA is out. My preference is Southern Tier’s nomenclature. Imperial Black Ale gets the point across. It’s clearly a Black Ale, but it’s been ramped up to Imperial proportions. I think at this point, the modifier “Imperial” is understood to mean high-gravity, high-ABV, and big hop profile. The reason I prefer “Black” to “Dark” is that beers like Oskar Blues Gordon or Terrapin’s Big Hoppy Monster fall into the “Imperial Red/Amber” category but could easily be described as “Imperial Dark Ales”. And they’re so different from something like the Iniquity that I’d hate to see them categorized the same way. I haven’t figured out a term for Saisons/Biere de Gardes yet. Maybe Imperial Golden Ale? Or Imperial Farmhouse Ale? With you on the Iniquity. Complex. Tasty. Well executed. As for Southern Tier, I’ve had their Unearthly Oak-Aged, their IPA, the Gemini, and the Iniquity, and I haven’t been disappointed. Great brewery. Nobody’s saying they’re on the same level as Russian River or Deschutes, but playing second fiddle to those guys aint too shabby.